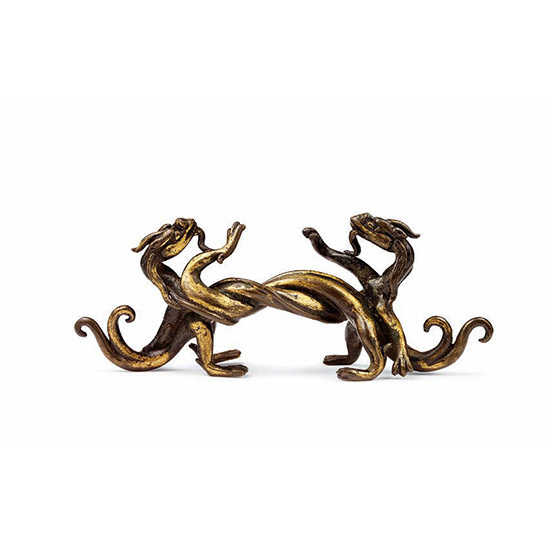 The bronze brushrest is cast in the form of a jiaolong 交龍, two entwined chilong dragons with confronting heads and bifid tails. The metal is of a deep brown colour and covered with a thin layer of gilding. The jiaolong motif first appeared in the Han Dynasty and is recorded in ancient texts such as the Zhou Li 周禮and Shi Ming 釋名. A related gilt-splashed bronze brushrest is published in Gerard Tsang and Hugh Moss’ book Arts from the Scholar’s Studio, 1986, pp. 178-179, Catalogue No. 156.